Bamboo is a surprisingly durable plant that can survive in various soil conditions such as sand, rock or dirt as long as the roots stay moist, the weather is fairly temperate and it does not encounter a lot of direct sunlight. The most popular bamboo to grow in rocks is the potted lucky bamboo plant, arranged with tied stalks of bamboo meant to symbolize luck for different areas of your life. 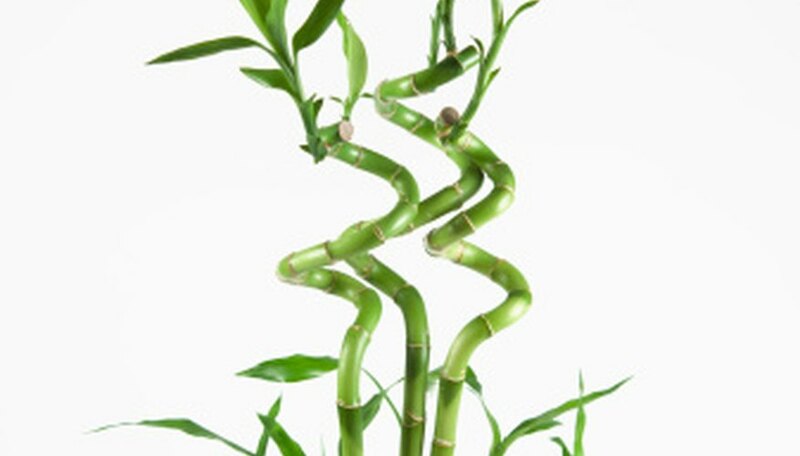 Lucky bamboo thrives on little attention as long as it is established properly from the beginning. Find a well-lit area out of direct sunlight in which to place your bamboo plant. Arrange a few bamboo shoots the way you want them to be potted. Hold the bamboo shoots in the pots or vase so the roots are a few inches above the bottom. Pour the rocks into the pot, still holding the bamboo in place, until it reaches within an inch of the lip of the pot and the bamboo is stabilized. Add water to the pot until you see it near the surface of the rocks. Allow the bamboo to dry for at least five days before watering again. Water the bamboo twice a week. Add grass fertilizer once or twice a year to keep the bamboo healthy. Bamboo experts recommend using organic slow-release grass fertilizer to keep your bamboo growing strong.